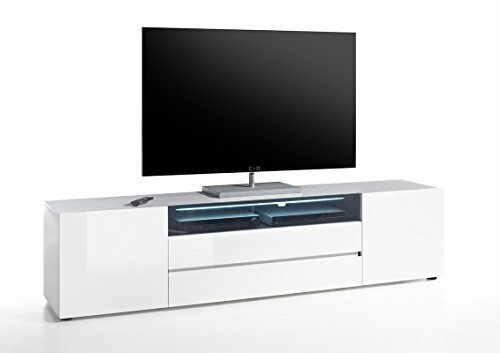 Manufactured in Italy, Europe, this contemporary TV cabinet has been designed using excellent materials so as to ensure a high quality final product. 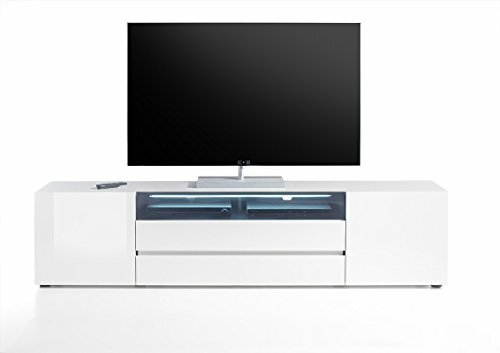 This European design TV stand is an ideal solution for anybody who desires a modern, minimalist look combined with spacious, strong storage capacity. 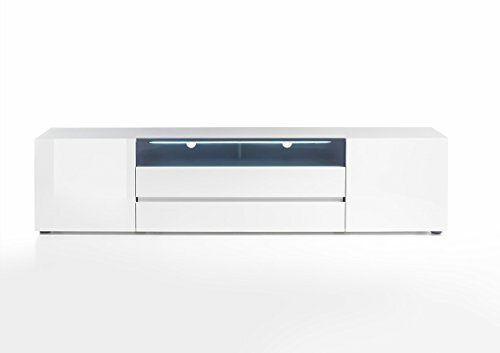 It comes in an attractive high gloss white lacquered finish creating a sleek modern look in your home. 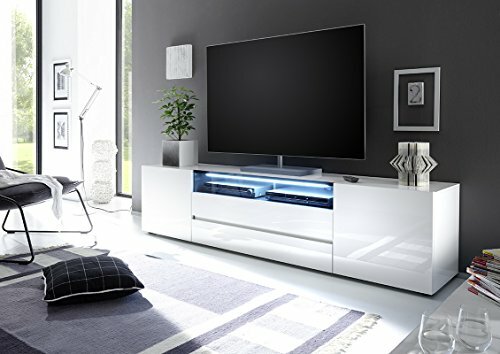 Additionally, the interior of this elegant TV console features a contrasting black color that provides a dynamic vibrant appearance perfectly complemented by illuminated blue LED light. * Please check the real width of your TV screen to ensure the television set is not overhanging the edge of the supporting furniture. 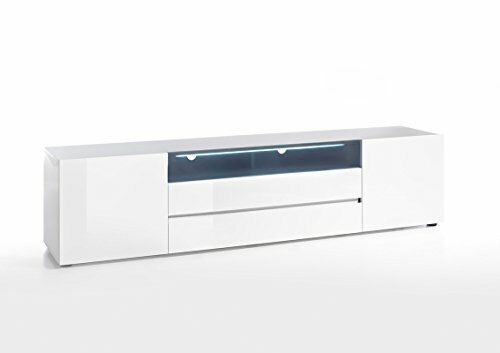 Manufactured in Italy this large, TV cabinet is made of robust, durable MDF lacquered in a High Gloss white finish. 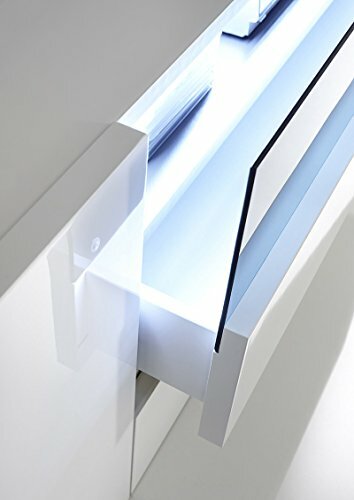 Main Features include: soft-closing system, 2 doors, 2 drawers, 1 IR Remote-Friendly compartment with attractive Black Glass illuminated by deep-set Blue LED Light. Internally this large TV cabinet has a contrasting black color that adds dynamic vibrancy to a contemporary, clean-lined design ideal for modern living. Flat-Packed Italian furniture. 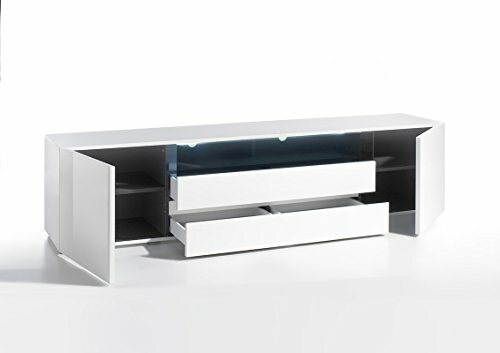 TV stand with cable management system. Easy to follow clear visual assembly instructions. Ready-to-assemble.